Before I get into today’s Peel Here column proper, I wanted to take a second to let everyone know that I’ve made it ten million times easier to browse through the archives of this column. In the past the Peel Here banners above and to the left in the sidebar have pulled up all of the previous columns on one page that took roughly eleven months, 7 days, and three hours to load. Not anymore. Now these banners will whisk you away to a brand new single portal page that’s split up into volumes (each 12 columns get their own volume.) So if you really wanted to take a second look at those C.H.i.P.s stickers, or you missed out on the 7-Eleven Rock Coins, you can now just browse through the various volumes (each of which list the posts in that volume.) You can either click on a volume to be taken to a page with all twelve of those posts, or you can click on the individual column you want to see. This set is sort of a weird duck. 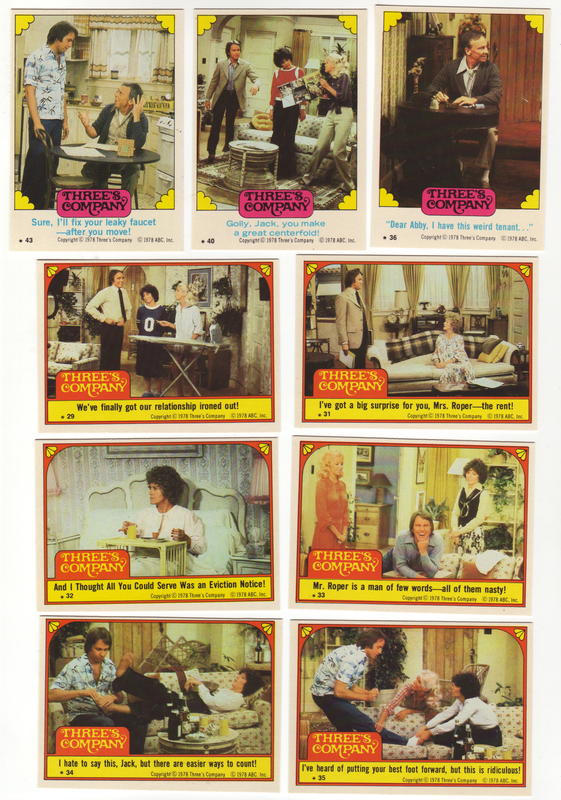 Like most Topps stickers (and subsets to regular card series) this set comes in a multiple of eleven with 44 total cards. 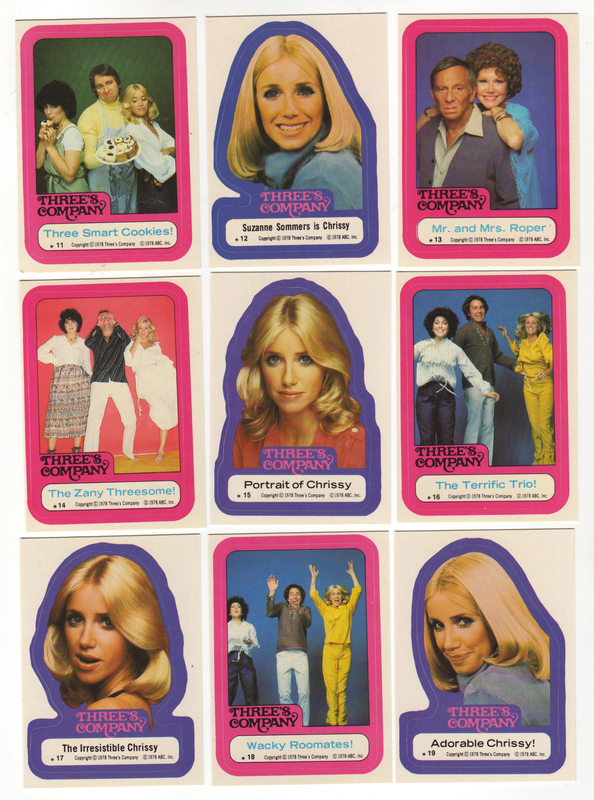 This is a little weird as the majority of the Topps licensed stickers at this time came in the form of 22 count subsets of a much larger series of bubblegum cards. 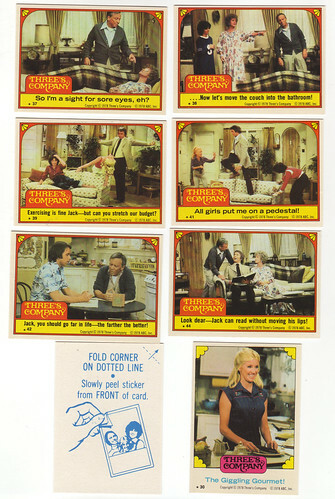 This Three’s Company set is just stickers, there aren’t any regular cards. 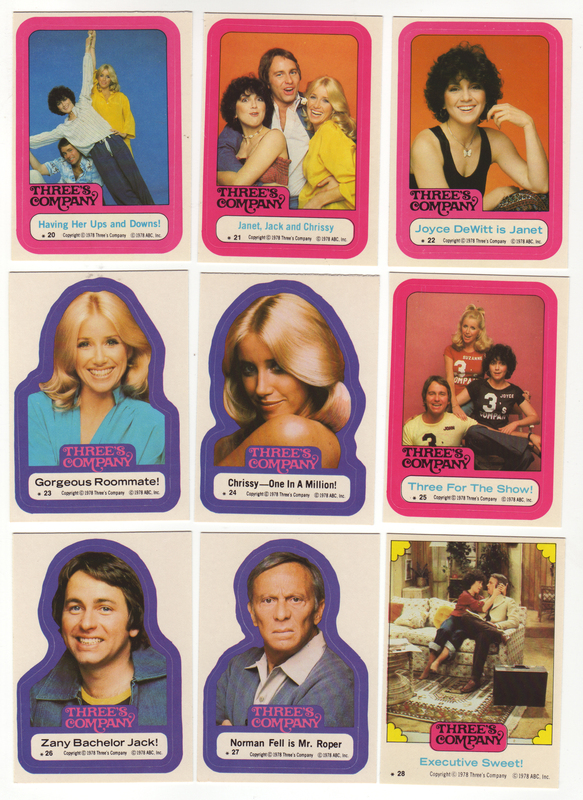 From what I can tell, Topps really didn’t start doing these 44 card sticker sets until the mid 80s with the Supergirl, 21 Jump Street, Return to Oz and Little Shop of Horrors sets (not to mention the various rock music sets featuring Michael Jackson, Cyndi Lauper, Duran Duran, and Menudo.) Also, aside from a handful of card-backs illustrating how to peel off the sticker, the majority of the set has blank white backs. 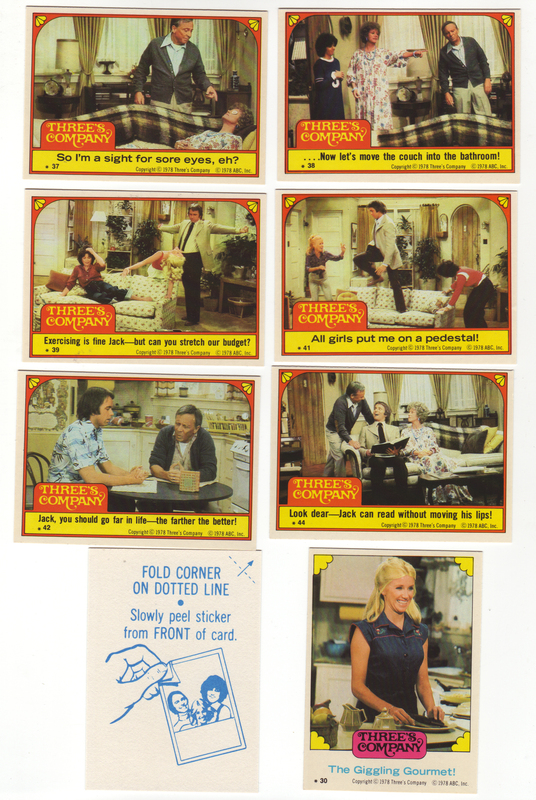 I have seen other blank backed sets, like the Incredible Hulk or Mork and Mindy, as well as sets that just had ads on the card-backs like the stickers for the first Alien flick. 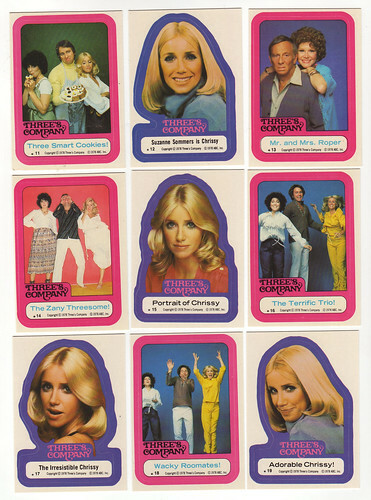 There are some variations of these stickers though, that include at least one set of puzzle backs that form to make a 15-card poster of Suzanne Sommers. Anyway, as far as the stickers themselves go, I have to say that I think it weird that so many sitcoms had this sort of merchandising in the 70s and 80s. 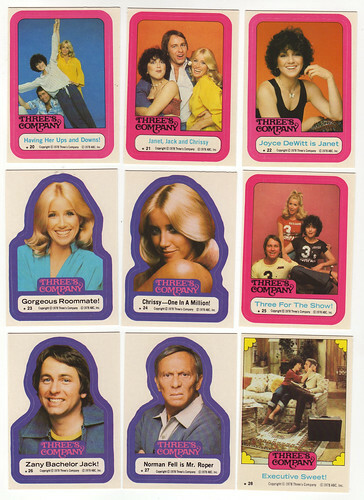 I can clearly see how popular some of these shows were, but it seems like there’s a big leap between trying your best to catch the most recent episode of the show for a few laughs and running out to your local 7-Eleven to pick up 10 to 15 packs of cards in hopes of completing a set of Three’s Company stickers. It’s really the hobby of the young or borderline obsessed, and again, I have a hard time seeing kids really getting into these stickers, even if they do love the show. It seems like an impulse, single pack purchase. 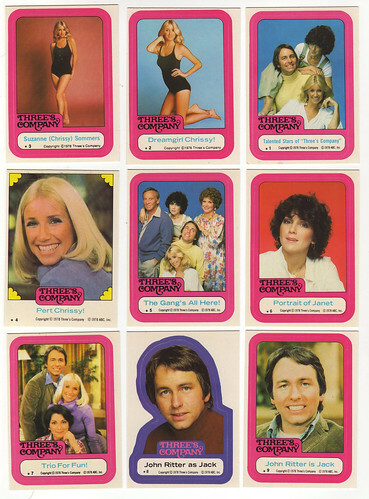 Out of five stickers you’re bound to get at least one Suzanne Sommers and John Ritter headshot sticker, and then you’re done. 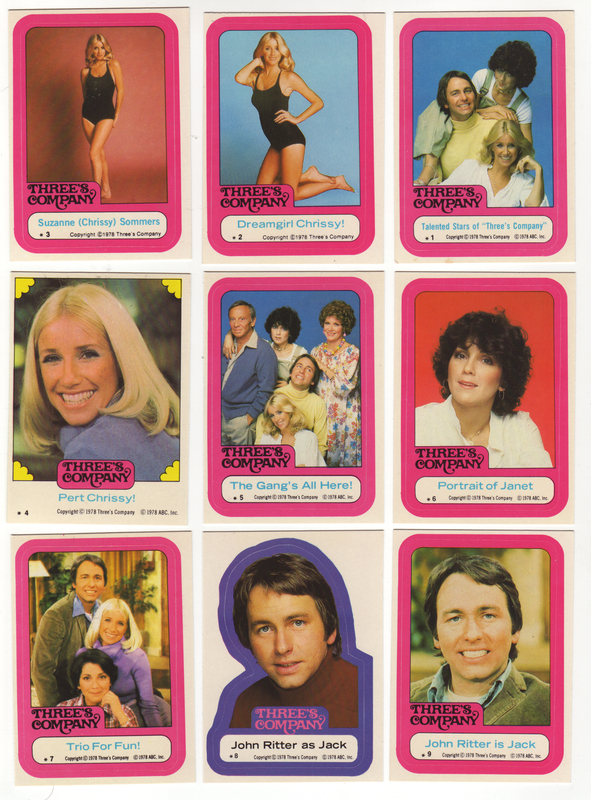 Alright, maybe some kids were looking for a Joyce Dewitt, but seriously at the time, who was pining for a Mr. Roper sticker? I can totally see the beauty in the sticker now, from a distance though. 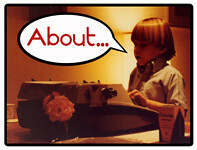 PreviousCartoon Commentary, a look at the 1st episode of He-Man and the Masters of the Universe! NextWhat can you really say about a film that involves a nerd deflowering a bowling ball that I didn’t already say with this title?